Trading on the Trinidad Stock Exchange ended with Republic Bank dropping 72 cents at the end of trading. 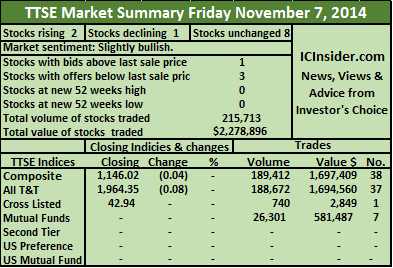 There was activity in the market, with 11 securities changing hands, of which 4 advanced, 3 declined and 4 traded firm with a total of 638,480 units, valued at $1,740,915. At the close of the market, the Composite Index lost 0.80 points to close at 1,145.6 the All T&T Index rose fell by 1.68 points to close at 1,962.76 and the Cross Listed Index increased by 0.01 points to end at 43.04. Gains| Stocks increasing in price at the close are, Clico Investment Fund gained 4 cents to end at $22.15 while trading 9,366 shares valued at $207,457, Jamaica Money Market Brokers was the volume leader with 518,756 shares changing hands for a value of $233,440 and gained a cent to 45 cents, Scotiabank traded 682 shares at $58.13 up a cent and West Indian Tobacco traded 537 shares at $119.03 for a 1 cent gain. Declines| The stocks declining at the end of trading are, Grace Kennedy contributed 40,000 shares with a value of $153,600, to close 1 cent down at $3.84 while by Sagicor Financial Corporation with a volume of 57,622 shares traded for $346,893, to end at a new 52 weeks’ low, of $6.01 after falling 4 cents, conversely, Republic Bank suffered a loss 72 cents to close at $120 as 1,285 shares traded. Firm Trades| Stocks closing with prices unchanged at the end of trading are, Angostura Holdings with 1,000 units ended at $12.75, First Citizens Bank had 2,472 units trading at $36.76, Massy Holdings added 6,260 shares valued at $429,123 to close at $68.55 and National Enterprises traded 500 shares at $17.49. IC bid-offer Indicator| At the end of trading the Investor’s Choice bid-offer indicator had 2 stocks with the bid higher than their last selling prices and 2 stocks with offers that were lower. Trading on the Trinidad Stock Exchange on Monday, ended with 8 securities changing hands,of which 2 advanced, none declined and 6 traded firm with a total of 206,158 units, valued at $2,315,534. At the close of the market, the Composite Index rose 0.39 points to close at 1,146.41, the All T&T Index rose fell by just 0.09 points to close at 1,964.44 and the Cross Listed Index increased by 0.09 points to end at 43.03. Gains| Stocks increasing in price at the close are, First Citizens Bank contributed 2,458 shares with a value of $90,356, to put on a cent at $36.76, Jamaica Money Market Brokers with 107,309 shares changing hands for a value of $47,216, gained 2 cents to close at 44 cents. Declines| No stock declined at the end of trading on Monday. 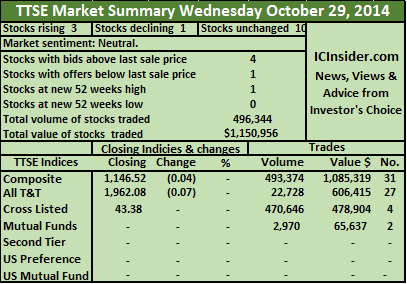 Firm Trades| Stocks closing with prices unchanged at the end of trading are, Angostura Holdings with a volume of 3,396 shares traded for $43,299 and ended at $12.75, Clico Investment Fund with 88,840 shares valued at $1,965,050, to end at $22.11, Guardian Holdings added 2,000 shares to end at $13.55, Massy Holdings traded 1,055 shares valued at $72,320 to close at $68.55, Republic Bank contributing 100 shares and closed unchanged at $120.72 and Scotiabank traded 1,000 shares to close at $58.12. IC bid-offer Indicator| At the end of trading the Investor’s Choice bid-offer indicator showed 1 stock with the bid higher than the last selling price and 2 stocks with offers that were lower. Trading on the Trinidad Stock Exchange closed the week with 11 securities changing hands, of which 2 advanced, only 1 declined and 8 traded firm with a total of 215,713 units, valued at $2,278,896. At the close of the market, the Composite Index lost 0.04 points to close at 1,146.02, the All T&T Index fell by 0.08 points to close at 1,964.35 and the Cross Listed Index remained at 42.94. 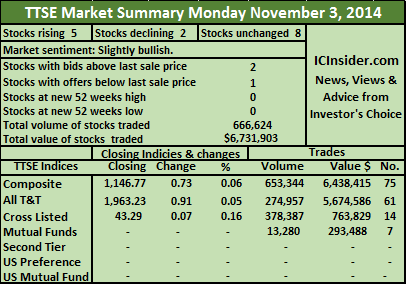 Gains| Stocks increasing in price at the close are, Clico Investment Fund with 26,301 shares valued at $581,487 and advanced by 1 cent to $22.11 and Scotiabank contributed 9,586 shares with a value of $557,018, increasing 5 cents to end the day at $58.12, as the stock continues to make a slow recovery from the sharp fall it has suffered since end of May. Declines| The only stock declining at the end of trading, is Republic Bank, with 300 shares at $120.72, as the price slipped a cent. Firm Trades| Stocks closing with prices unchanged, at the end of trading are, First Citizens Bank which traded 1,610 shares, to close at $36.75, Grace Kennedy closed with 740 shares at $3.85, Guardian Holdings with a volume of 13,995 shares traded for $189,662, closed at $13.55, while Massy Holdings added 7,894 shares valued at $541,134 to close at $68.55, National Enterprises closed with 100 units at $17.49, Point Lisas Industrial Port had 490 units trading at $4.05, Trinidad Cement with 154,497 shares changing hands, for a value of $307,449.03, closed at $1.99 and L.J. Williams B traded 200 shares at 90 cents. IC bid-offer Indicator| At the end of trading the Investor’s Choice bid-offer indicator had 1 stock with the bid higher than the last selling price and 3 stocks with offers that were lower. Trading on the Trinidad Stock Exchange ended with 17 securities changing hands of which 3 advanced, 4 declined and 10 traded firm with a total of 89,562 units, valued at $2,032,287. At the close of the market, the Composite Index lost 0.77 points to close at 1,146.06, the All T&T Index rose 0.18 points to close at 1,964.43 and the Cross Listed Index fell by 0.23 points to end at 42.94. Gains| Stocks increasing in price at the close are, ANSA McAl with 1,495 shares advanced by 2 cents to end at $12.75, Scotiabank contributed 7,666 shares with a value of $445,155, to close $58.07 and Unilever Caribbean increased 3 cents, to end at $64.22 with 4 units traded to close at a new 52 weeks’ high. Declines| The stocks declining at the end of trading are, Jamaica Money Market Brokers that added 7,476 shares but lost 3 cents, to end at 42 cents, National Commercial Bank with 12,300 shares changing hands, for a value of $12,054 but lost 2 cents, to close at 98 cents, One Caribbean Media lost 2 cents with 721 shares in closing at $25.10 and Republic Bank with 2,273 shares changing hands for a value of $274,419 and closed at $120.73 as the price slipped by 1 cent. 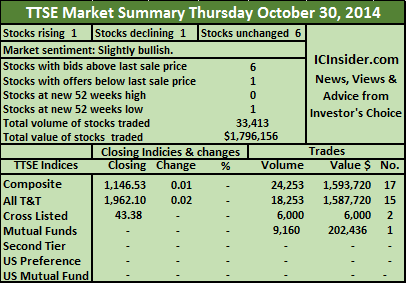 Firm Trades| Stocks closing with prices unchanged at the end of trading are, Angostura Holdings with a volume of 8,552 shares, traded for $109,036 and closed at $12.75, while Clico Investment Fund with 31,215 shares valued at $689,852 remained at $22.10, First Citizens Bank traded 1,319 shares, to close at $36.76, Grace Kennedy traded 765 units at $3.85, Guardian Media 925 shares $19.75, Guardian Holdings 3,184 shares at $13.55, Massy Holdings traded 3,689 shares valued at $252,918 and closed at $68.55, National Flour Mills 2,500 shares ended at $1.10, Sagicor Financial Corporation with 478 shares, closed at $6.05 and Trinidad Cement with 5,000 shares closed at $1.99. Trading on the Trinidad Stock Exchange ended with 9 securities changing hands, of which 5 advanced, 1 declined and 3 traded firm, with a total of 64,377 units, valued at $895,542. At the close, the Composite Index rose 0.13 points to close at 1,146.83, the All T&T Index gained 1.16 points to close at 1,964.25 and the Cross Listed Index fell by 0.12 points to end at 43.17. Gains| Stocks increasing in price at the close of trading are, Angostura Holdings with 14,903 shares changing hands valued at $190,013 and gained 20 cents to end at $12.75, Point Lisas traded 1,839 shares to close with a gain of 5 cents, to end at $4.05, Republic Bank contributed 80 shares as the price closed up 74 cents, at $120.74, Scotiabank with 214 shares ended with a gain of 4 cents at $58.05 and West Indian Tobacco rose 2 cents to $119.02, while trading 80 units. Declines| The only stock declining at the end of trading is, Sagicor Financial Corporation in trading 18,472 shares valued at $111,756, as the price fell 14 cents, to end at $6.05. Firm Trades| Stocks closing with prices unchanged, at the end of trading are, Clico Investment Fund with 14,560 shares valued at $321,776 at $22.10, First Citizens Bank traded 1,695 shares to close at $36.75 and Guardian Holdings contributed 12,526 shares with a value of $169,697, to end at $13.55. IC bid-offer Indicator| At the end of trading the Investor’s Choice bid-offer indicator had 3 stocks with the bid higher than their last selling prices and 2 stocks with offers that were lower. Trading on the Trinidad Stock Exchange closed with 15 securities changing hands of which 2 advanced, 3 declined and 10 traded firm, with a total of 222,485 units, valued at $2,436,444 traded. At the close of the market, the Composite Index lost 0.07 points to close at 1,146.70, the All T&T Index fell by 0.14 points to close at 1,963.09 and the Cross Listed Index remained at 43.29. Gains| Stocks increasing in price at the close are, Angostura Holdings that gained 5 cents, to end at $12.55 while 1,724 units were traded and Scotiabank gaining just a cent, to end at $58.01 with 1,371 units changing hands. Declines| The stocks declining at the end of trading are, Guardian Holdings added 19,230 shares valued at $260,567 and closed 5 cents lower, at $13.55, Massy Holdings traded 1,200 shares to close with a 1 cent loss, at $68.55 and National Enterprises with 1,518 shares traded, to close at $17.50. 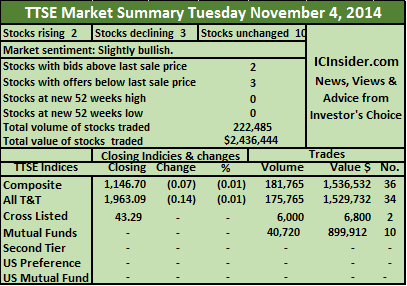 Firm Trades| Stocks closing with prices unchanged at the end of trading are, ANSA McAl with only 100 units changing hands, to end at $66.15, Clico Investment Fund with 40,720 shares valued at $899,912, remained at $22.10, First Citizens Bank contributed 21,500 shares with a value of $790,128, to end at $36.75, Guardian Media added only 20 shares to close at $19.75, National Flour Mills with 28,166 shares being traded for $30,983, closed at $1.10, National Commercial Bank traded 4,000 shares and closed at $1, Scotia Investment with 2,000 shares trading, ended at $1.40, One Caribbean Media contributed 846 shares at $25.12, Trinidad Cement with 100,000 shares changing hands for a value of $199,092, closed at $2 and West Indian Tobacco traded 90 units, to close at $119. IC bid-offer Indicator| At the end of trading the Investor’s Choice bid-offer indicator had 2 stocks with the bid higher than their last selling prices and 3 stocks with offers that were lower. 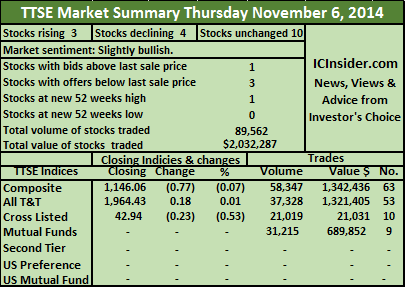 Scotiabank seems to have hit bottom, with good buying coming into the market on the first trading day of November, pushing the price up by a small amount. 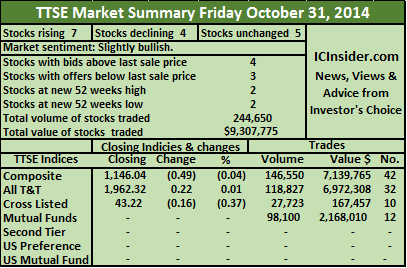 IC insider has elevated the stock to BUY RATED status. At the close, there was 18,922 units on the bid to buy at $58 and a small volume to sell, at $59.50. Trading on the Trinidad Stock Exchange ended with 15 securities changing hands, of which 5 advanced, 2 declined and 8 traded firm, ending with a total of 666,624 units, valued at $6,731,903. At the close of the market, the Composite Index rose 0.73 points to close at 1,146.77, the All T&T Index gained 0.91 points to close at 1,963.23 and the Cross Listed Index fell / increased by 0.07 points to end at 43.29. Gains| Stocks increasing in price at the close are, Guardian Holdings added 53,950 shares valued at $733,720 to end 9 cents higher at $13.60, Massy Holdings traded 43,706 shares valued at $2,996,483 to close with a gain of 2 cents to end at $68.56, Sagicor Financial Corporation traded 60 shares valued at $6.19 to close with a gain of 14 cents Scotiabank gained 2 cents to $58 while trading 13,544 units valued at $785,552 and seems to have clearly bottomed and West Indian Tobacco gained 23 cents to end the day at $119 while trading 2,425 units. 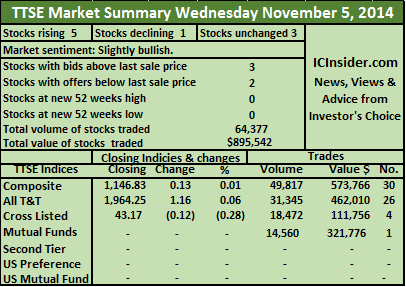 Firm Trades| Stocks closing with prices unchanged at the end of trading are, ANSA McAL with 685 shares closed unchanged at $66.17, Clico Investment Fund with 13,280 shares valued at $293,488 remained at $22.10, First Citizens Bank traded 13,331 shares to close at $36.75, Grace Kennedy contributed 128,489 shares with a value of $494,680 to end at $3.85, Jamaica Money Market Brokers traded firm at 45 cents after trading 1,038 units, National Commercial Bank with 200,000 shares changing hands for a value of $200,000 and closed at $1, National Enterprises traded 2,056 shares to close unchanged at $17.50 and Scotia Investments closed at $1.40 with 48,800 units changing hands. IC bid-offer Indicator| At the end of trading the Investor’s Choice bid-offer indicator had 2 stocks with the bid higher than their last selling prices and 1 stock with the offer that was lower. Trading on the Trinidad Stock Exchange closed with 16 securities changing hands of which 7 advanced, 4 declined and 5 traded firm, with a total of 244,650 units, valued at $9,307,775 trading. At the close of the market, the Composite Index fell by just 0.49 points to close at 1,146.04, the All T&T Index rose 0.22 points to close at 1,962.32 rose and the Cross Listed Index fell 0.16 points to end at 43.22. Gains| Stocks increasing in price at the close are, ANSA McAL added 11,518 shares valued at $762,135, to gain 2 cents to $66.17, Ansa Merchant Bank closed at a new 52 weeks’ high of $39.42, up a cent while 5,260 shares changed hands, Guardian Holdings gained a cent to close at $13.51 while trading 9,271 units, One Caribbean Media ended with a 1 cents increase to $25.13 with 500 shares, Trinidad Cement put on a cent to end at $2.03 with 5,600 units, Unilever was up 4 cents to close at a new 52 weeks’ high of $64.19 while 5,808 units changed hands with a value of $372,815 and West Indian Tobacco gained 16 cents to end the day at $118.77 as 4,110 shares were traded valued at $488,144. Declines| The stocks declining at the end of trading are, Massy Holdings traded 11,000 shares valued at $753,940 to close at $68.54 with a loss of 1 cent, Republic Bank with 27,285 shares being traded for $3,293,884 shed 75 cents to $120. Sagicor Financial contributed 27,078 shares, valued at $163,909 but fell 20 cents to close at $6.05, for a new 52 weeks’ low and Scotiabank traded 6,125 shares valued at $355,127 to close with 1 cent loss at $57.98 a new 52 weeks’ low. Firm Trades| Stocks closing with prices unchanged at the end of trading are, Clico Investment Fund with 98,100 shares valued at $2,168,010 remained at $22.10, Firstcaribbean International Bank 645 shares to end at $5.50, First Citizens Bank traded 1,500 shares at $36.75, National Enterprises with 30,550 shares changing hands for a value of $534,325 closed at $17.50 and National Flour Mills with 300 shares ended at $1.10. IC bid-offer Indicator| At the end of trading the Investor’s Choice bid-offer indicator had 4 stocks with the bid higher than their last selling prices and 3 stocks with offers that were lower. Only 8 securities traded on the Trinidad Stock Exchange on Thursday, 1 advanced, 1 declined and 6 traded firm resulting in a total of 33,413 units changing hands, valued at $1,796,156. At the close of the market, the Composite Index rose 0.01 points to close at 1,146.53, the All T&T Index edged up 0.02 points to close at 1,962.10 and the Cross Listed Index remained at 43.38. Gains| Trinidad Cement inched up a cent to $2.02 while trading 1,000 shares to be the sole stock to gain in price. Declines| The only stock declining at the end of trading is Scotiabank with 1,000 shares, fell 1 cent to close at $57.99 to a new 52 weeks’ low. 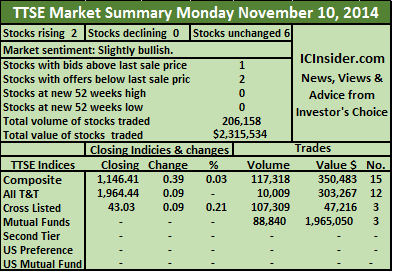 Firm Trades| Stocks closing with prices unchanged at the end of trading are, Agostini’s traded 284 shares at $17.34, Clico Investment Fund with 9,160 shares valued at $202,436 closed at $22.10, First Citizens Bank traded 869 shares to close at $36.75, Guardian Holdings contributed 3,100 shares to end at $13.50, National Commercial Bank with 6,000 shares closed at $1 and Republic Bank with 12,000 shares changing hands for a value of $1,449,000, ended at $120.75. With results being released for the September quarter and the end of the year nearing, financial information may be forthcoming that could result in more interest in some of the stocks. The number of stocks with bids higher than their last sale prices is in keeping with the above. IC bid-offer Indicator| At the end of trading the Investor’s Choice bid-offer indicator was showing a moderately bullish signal as had 6 stocks closed with bids higher than their last selling prices and 1 stock with the offer that was lower. Trading on the Trinidad Stock Exchange ended with 14 securities changing hands, of which 3 advanced, 1 declined and 10 traded firm with a total of 496,344 units, valued at $1,150,956. At the close of the market, the Composite Index lost 0.04 points to close at 1,146.52, the All T&T Index fell by 0.07 just points to close at 1,962.08 and the Cross Listed Index remained unchanged at 43.38. Gains| Stocks increasing in price at the close are, Unilever Caribbean with a 4 cents gain to $64.15 after trading 133 units to close at a new 52 week’ high, National Commercial Bank with 450,000 shares changing hands for a value of $450,000 closed 2 cents higher at $1 and West Indian Tobacco put on 5 cents to end at $118.61 while trading 300 shares. Declines| The only stock declining at the end of trading is, One Caribbean Media added 4,235 shares valued at $106,383, falling 13 cents to end at $25.12. 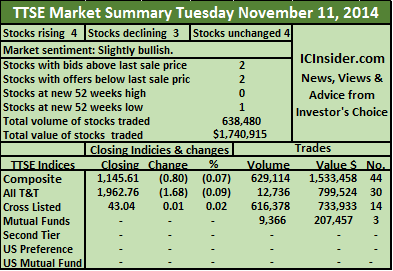 Firm Trades| Stocks closing with prices unchanged at the end of trading are, Angostura Holdings with 8,137 shares valued at $101,713, traded at $12.50, Clico Investment Fund with 2,970 shares valued at $65,637 ended at $22.10, First Citizens Bank had 1,940 shares trading to end at $36.75, Guardian Holdings had 3,000 units trading at $13.50, Massy Holdings traded 2,134 shares at $68.55, National Enterprises 302 shares ended at $17.50, National Flour Mills 1,000 closed at $1.10, followed by Scotiabank traded 1,547 shares at $58 and Scotia Investments with a volume of 20,646 shares being traded at $1.40. IC bid-offer Indicator| At the end of trading the Investor’s Choice bid-offer indicator had 4 stocks with the bid higher than their last selling prices and only 1 stock with the offer lower.